You will be met and transferred from the airport to your Emerald Waterways luxury river cruise ship. This evening join your fellow travellers for a welcome dinner and drinks. Sail out of Budapest early morning towards Kalocsa, one of the oldest towns in Hungary, famous for the production of paprika. This afternoon visit a local Puszta Horse Farm and enjoy a performance showcasing the exceptional riding skills of Magyar horseman. Tonight the Captain will be delighted to host a gala dinner. Today you will embark on an incredible journey to the first and biggest architectural archaeological excavation in Eastern Europe, the Viminacium Archaeological Excavation Site and Museum. This site was one of the most important Roman cities and military camps in the period from 1st to 4th centuries. Its exceptional strategic importance was reflected both in the defence of the northern border of the Roman Empire and in turn of communications and commercial transactions. In the morning, relax on board as you sail through the narrow gorge between the European Alps and Carpathian Mountains known as the Iron Gates. The narrow and once dangerous passage boasts spectacular scenery forming the border between Romania and Serbia. Arrive in Vidin, the most eastern town in Bulgaria. Antwerp is Belgium’s second-largest city and one of the world’s most important ancient seaports. It merges the new with the old and offers the attractions and atmosphere you’d expect from a European city—friendly people, fabulous architecture, chic shops, interesting museums, vibrant cafés, charming galleries, and historic monuments. Included sightseeing with a Local Guide shows you its superb architecture; the central Grote Markt, lined with 16th-century houses; the beautiful city hall, completed in 1566; and the Church of Our Lady, started in 1352 and featuring paintings by Rubens. An optional excursion is available to nearby Brussels, Belgium’s capital and home of the European Union. EmeraldPLUS: Choir Concert in Arbanasi. This morning disembark your Emerald Waterways luxury river cruise and journey by road to Romania's capital, Bucharest. 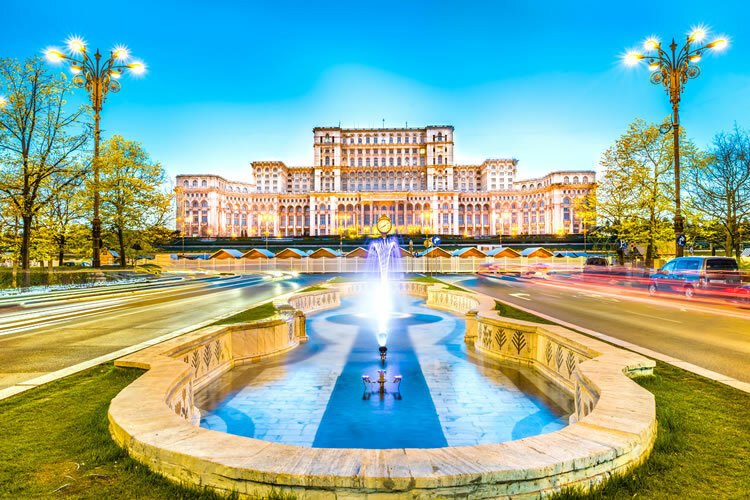 Your city tour includes the enormous Palace of the Parliament; Europe's largest building constructed by former dictator Nicolae Ceausescu. The city's wide avenues have a distinctly French feel; in fact the city is often referred to as the Paris of the East. Included is a one night stay in Bucharest.